Super Bowl 51 NFL Pitch. Last night, the New England Patriots beat the LA Rams 13-3 to take home their second Super Bowl in three years and their sixth Super Bowl win overall out of nine trips to the final. But although the Super Bowl is ‘technically’ about the game, for anyone even vaguely interested in event management and live production, it’s the Half Time Show that is the real one to watch; the Super Bowl Super Plan. Anybody that is anybody in the music world has played the Super Bowl Half Time Show, with many viewers now tuning in for the that as opposed to the American football. In earlier years, the spot was reserved for music legends, like James Brown, Stevie Wonder, and Diana Ross and it was the music that did the talking. However as technology has developed, in more recent years, with the aid of a flawless production team, Beyonce, Bruno Mars and Lady Gaga have all pulled off spectacular live performances. 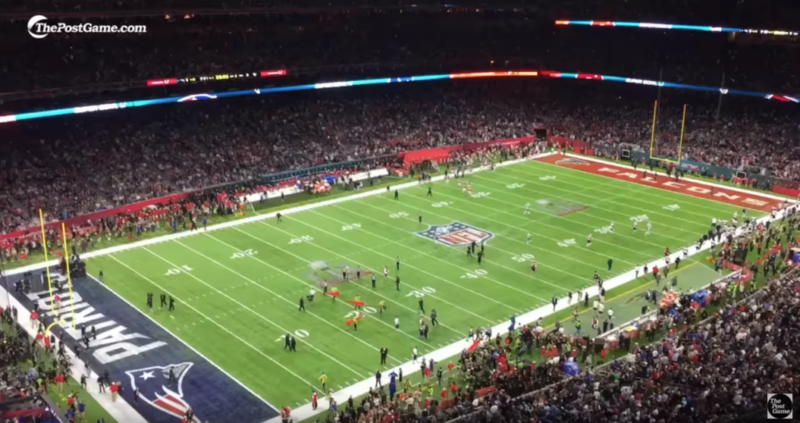 The planning and logistics that goes into the much-anticipated half time performance starts up to 12 months in advance of the event, so almost as soon as one Super Bowl is over, the NFL team behind it have to start thinking about the next one. And its not just about which music superstar will be headlining the prestigious slot that needs a lot of thought. Normal rock and pop concerts that tour arenas and stadiums often have build in’s of 2-3 days prior to the shows to bring in infrastructure, stage build and audio visual. At the Super Bowl Half Time Show, they have 6 minutes. Yep, you read that right. They have a 6-minute rig and 6-minute de-rig time for one of the most viewed live productions of every year. Staging, lighting, sound; all to come through the team tunnels of that years chosen arena, all to be put in place manually (No vehicles allowed, this is the Super Bowl after all. Any damage to the turf would be a huge no-no and delay the rest of the game!) and all to look impressive enough to wow the world. As soon as the half time whistle blows and the players leave the field, it is action stations. As the worlds most expensive airtime is filled with the latest bespoke adverts from the worlds biggest brands; live on the ground it is a hive of activity. A team of hundreds of ground staff magically appear and start a well choreographed dance as they transform the field. After a somewhat hectic, but not chaotic, 6 minutes, the feet on the ground that make this magic happen then get to step in and be the faces in the crowd in the front row, getting up close and personal with the stars. And then as soon as the last firework is set off, the entire process is repeated in reverse. 6 more hectic, but not chaotic, minutes later, and its job done. The field is empty once more and the second half can kick off. It truly is an absolute triumph in planning and logistics and a fascinating watch for #Eventprofs everywhere! Helen Brady is Event Manager for Events Northern Ltd. With experience not only as an Event Manager, but as a Visual Merchandiser and Venue Dresser, Helen has been organising things and trying to make them look pretty since 1988!